Monflo Client provides a few default game control layouts, but to easily play a PC game on your Android device it is recommended to customize game controls for every game. Please read the following tutorial to learn how quickly create new layouts and customize it to play any PC game on Android Device with Monflo Client app. To create a good layout for your PC game it is required to place game controls for all basic actions you do in the game. 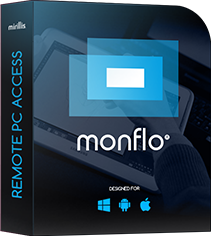 Start Monflo Client app and connect to your PC. Run the PC game that you would like to play on your Android device. Monflo Client will automatically switch to game control mode showing a default game control layout. Open app Menu and tap Game Control Layouts. In the layouts manager you will see a list of layouts on the left side and a layout preview on the right. Review all default layouts and select the layout that you feel will be the best to start customization for your PC game. Tap layout name and hold a finger for a short while to show layout options menu. Select Duplicate to create a new layout that will be a copy of selected default layout. Enter a new name for your new layout. We recommend to use a game title for layout names. Now, your new layout should show up at the end of the layouts list. Select your new layout and tap Edit to start layout customization. You will learn basic game controls editing like game controls selection, moving controls, resizing and assigning mouse and keyboard events. To select a game control just tap it. Selected game control will be highlighted and its description and options will be displayed on the left panel. To move selected game control just hold it with a finger and move over the screen. Game control cannot be placed in position that will interfere with any other game control in the layout. To resize game control, tap your game control to select it and use Size slider available on the left panel. To change mouse or keyboard actions, select a game control and tap the event in the left panel (OnPress, OnUp, OnLeft, etc...). For every event you can assign a single mouse or keyboard action or make a combination of mouse and keyboard actions. For Button controls you can also select a color and icon. To save changes made to a layout please remember to tap Accept. To add a new game control to your layout please use Add button at the top and select game control type from a list. New game control will be place at the center of the screen. Now you need to place your new game control on the screen, customize its size and mouse or keyboard events. To remove a game control from your layout simply select it and tap Remove button. All your layouts can be exported to a server, layouts will be stored online and assigned to your account. This way you can access (import) layouts stored on a server with any of your Android mobile devices. With Monflo Client sharing layouts between devices is very easy. To export a layout to server hold a finger on the layout name to show layout options and select Export layout to server. To import a layout from server simply hold a finger on any layout name to show options menu, select Import layout from server and select a layout name that you would like to import to your Android device. 5. How to apply a selected game control layout to a game? To apply your new layout to a game use Apply button. Monflo Client remembers applied layouts for every PC game. Next time when you run a PC game, Monflo Client will automatically show an appropriate game control layout.